What do you get if you take a revolutionary airframe, sleek, aerodynamic, very low drag, and give it two lethargic excuses for jet engines, a pair of hair-driers permanently set on low? You certainly don’t get the Mach 2 performance you spent hours designing into that airframe. No, instead, you get the strictly subsonic Douglas X-3. “On 27 October 1954, Walker made an abrupt left roll at Mach 0.92 and an altitude of 30,000 ft (9,144 m). 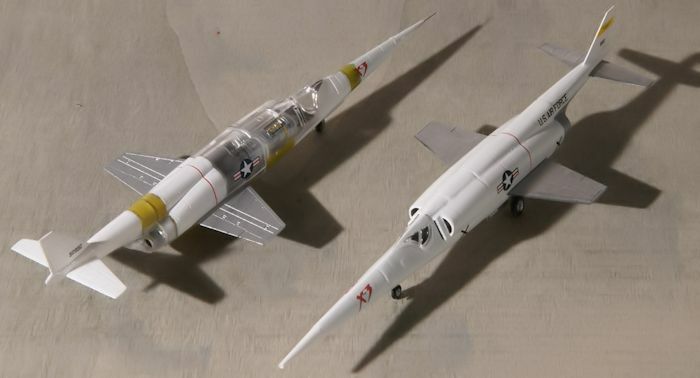 The X-3 rolled as expected, but also pitched up 20° and yawed 16°. The aircraft gyrated for five seconds before Walker was able to get it back under control. He then set up for the next test point. 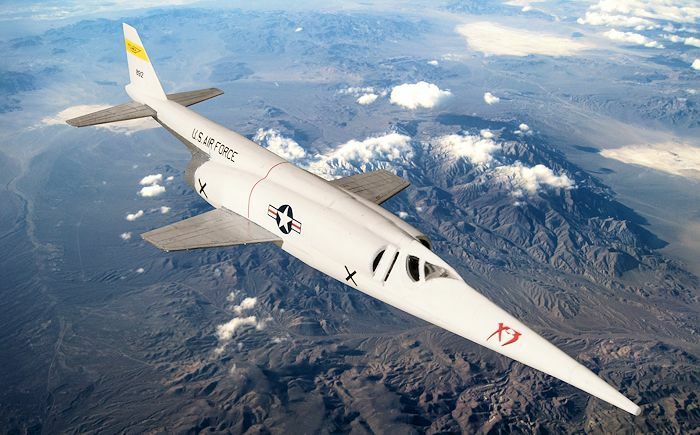 Walker put the X-3 into a dive, accelerating to Mach 1.154 at 32,356 ft (9,862 m), where he made an abrupt left roll. The aircraft pitched down and recorded an acceleration of -6.7 g (-66 m/s²), then pitched upward to +7 g (69 m/s²). At the same time, the X-3 side-slipped, resulting in a loading of 2 g (20 m/s²). Walker managed to bring the X-3 under control and successfully landed”. After this it was found the airframe had suffered so much load that it nearly broke up in flight. Other supersonic planes (like the F-100) had suffered some similar accidents and the information from this program helped the search for a resolution to this dangerous phenomenon. The X-3 is on display at the USAF museum at Wright-Patterson AFB in Ohio, USA. Previewed where else but right here on MM, this is a double-banger from Dragon and one with a cool quirk. It’s done in transparent plastic and includes those pathetic Westinghouse J34 engines that gave the plane a thrust to weight ratio of 0.4 (not great on a lightweight partially titanium airframe that only weighed 7.3 metric tons empty). Even though only one airframe was completed, having two in the kit means you can do one in finished configuration and one fully or partially see-through. Or you could do one in flight and one on the apron. It comes with decals for two schemes, early and late. I found the kit to be as nicely engineered and moulded as set out in the MM preview. You need to assemble the engine and install it even if you’re not doing the see-through version, for two reasons. First, you can see the front of the engines through the air intakes, and second, it helps with the noseweight, as the needle nose doesn’t leave much room for ballast. The airframe assembles in solid pieces from front to back, rather than top-bottom or left-right halves. Be sure to install the ejection seat before you put the engines in – it won’t fit through the canopy opening and has to go in from behind. The engine exhaust nozzles attach from the inside too, so don’t forget those. You can wait until later to put the wings on, as they attach from the outside. The parts go together very cleanly and positively, and you could just about build this without glue, although the central part of the fuselage where the wings join won’t stay together on their own for long. Still, there are really no traps in building this plane as long as you pay attention to the points above and put things together in the proper sequence. You certainly don't need any filler at all, and just a light swipe with some fine sandpaper to eradicate the seam lines (which aren't at the joins, but just on top of the fuselage). It comes with some thin wire for the pitot and the nose point could use some work to make it really fine. I neglected to do this. I decided to have a bit of fun with this kit and take advantage of the see through plastic. I messed around with different combinations of interior colours before settling on a combination of aluminium and interior green for different portions of the airframe, painted on the inside, and then the white skin painted on the outside. I consulted no references for this, just imagined what seemed plausible. I went with the aluminium colour for areas around the engine and exhaust, and the interior green for other spots. Perhaps the real thing never had its interior painted in that way, but I like the look of it. I painted some colourful pipes and wiring on the engines, again without consulting references, but just to give it a bit of colour and texture. Once all that was done and the plane assembled, I worked out the areas I wanted to be transparent, and painted the rest white (I should have masked it, but I was lazy so I freehanded it carefully). At the same time, I painted the other airframe which was being built alongside in the regular way. I brush painted several coats of Tamiya X-2 gloss white, rather than spraying (I had some bad luck on a different model just days before so I'd lost my confidence with Tamiya spray white). The only other colour on this really is the silver you need at the tail end and the wings. Check the instructions or your references carefully because one markings scheme has a different tail-end layout than the other, with more silver on one and more white on the other (including that one version has white tailplanes and the other silver). There are not many decals and they perform well. I used Mr Mark Softer which also worked out well. A good kit, with the added flexibility of two models and clear plastic. It's not super simple, despite the size and low part count, but it's pretty easy to build. A weird but ultimately cool looking plane, not widely known and which doesn't take up much shelf space - recommended.